I am the world’s worst camper. I can hike all day, sit around the fire pit, cook outdoors, get dirty, forgo showers, eat trail mix, run barefoot through the grass, and breathe in the fresh air, but please, please, PLEASE don’t make me sleep in a tent. I will spend a day in the wilderness but, when it’s time for bed, I want to be home, snuggled in my Serta, bathed in glorious air conditioning and the dark silence of my apartment. That’s how I like it: cool, calm, and under my control. Will I survive a night in the woods? Or will I run home, cry to my mommy, and give up my fantasy of channeling Cheryl Strayed from the novel Wild? Much to my surprise, Headwaters was a comfortable, clean, and relaxing escape that did not involve my typical camping fears: sleeping on the ground, killing creepy-crawly bugs, or using an outhouse. 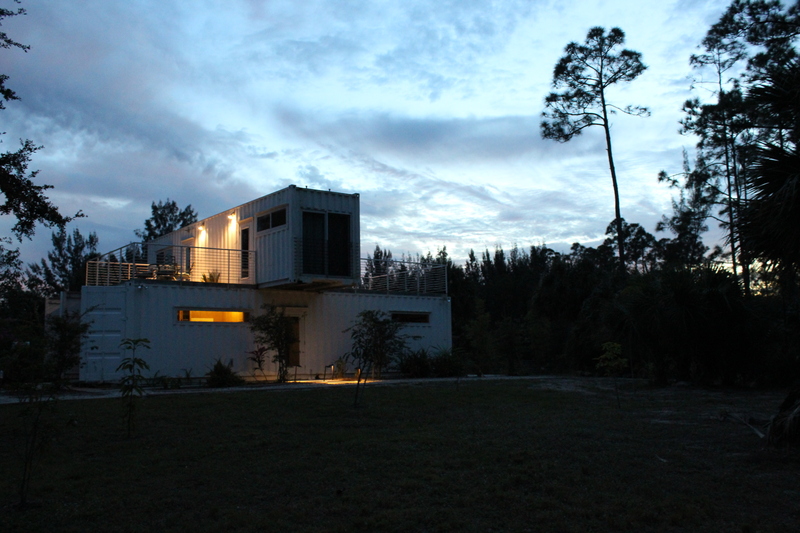 Constructed from three upcycled shipping containers, the structure is the first of its kind in the area. It’s a two-story, hurricane-proof cabin with the modern comforts of running water and electricity and the option to use portable air conditioners and heaters. The entire building sleeps eight, making it a perfect outdoor getaway for families looking to “camp” sans tents. The first floor consists of the kitchen, living room, dining room, and master bedroom with an attached bunk room for children or extra guests. The kitchen comes stocked with cups, plates, and silverware and includes a microwave, stove top, sink, and coffee maker. After we unloaded our groceries and coolers, P and I made a mad dash around the place, checking out all the nooks and crannies. The master bedroom boasted a queen size bed made up with freshly laundered sheets. It was a far cry from my Girl Scout days of sleeping bags and plastic covered mattresses. Just off the master bedroom, separated by sliding doors, is the bunk room with a futon bunk bed. There was also a little portable heater, which came in handy overnight. The bathroom was clean and modern with a regular old indoor toilet (hallelujah! ), a shower with hot water (can I get another hallelujah? ), and a super cool glass bowl sink. We had a plentiful supply of fresh towels and wash cloths in the adjoining linen closet. P even discovered the bongo drum (which you can kind of see him holding in the above photo) and settled in on the cozy leather couches. The best part of Headwaters is the absence of electronics. As someone who sits in front of a computer all day, it was nice to spend a weekend without television or the internet. Wi-Fi is available but why would you want to miss out on the action outdoors? Trust me, it will be okay if you leave the laptop and iPad at home. The bongo drum is much more entertaining. P and I did not use the second floor living space but we wandered upstairs to take a look. It sleeps five between a queen size bed and another futon bunk bed. (P did his best Where’s Waldo impression). A toilet and a shower separate the two rooms. Hike or bike through Riverbend Park – the entrance is just down the street. The cabin has bikes for eight campers. Canoe or kayak down the Loxahatchee River, which runs along the back of the property. Canoes and kayaks are provided. Build a fire in the outdoor fire pit and roast marshmallows for s’mores. P and I took full advantage of the fire pit and wood pile. He even relived his glory days from YMCA youth camp in north Georgia. Little did I know, I’m marrying the Brawny Paper Towels man. A word of advice: make sure you bring your own starter log with you. After an hour of failed fire building, we whimped out and ran to Publix for a DuraLog. Finally enjoying our fire – DuraLog to the rescue! Early the next morning, after coffee on the sky deck, we decided to go for a quick canoe trip before church. The Loxahatchee River is literally only a hop, skip, and jump away from the back door of Headwaters. There are a myriad of canoes and kayaks to chose from – pick whatever floats your boat! After a only a minor mishap launching the canoe into the water, we took off for a leisurely paddle. It was a cool, quiet morning and we were the only canoe on our stretch of the river. If you’re feeling extra ambitious, it is possible to canoe through Riverbend Park and on to Jonathon Dickinson State Park, a five to seven hour trip. All in all, our weekend at Headwaters Jupiter proved that I’m a better camper than I thought I was … if given the opportunity to sleep in a climate controlled metal box with a portable heater and running water. Nestled in Jupiter Farms, the property’s proximity to multiple natural areas (Riverbend Park, Cypress Creek Natural Area, Jonathan Dickinson State Park, and the beaches) as well as civilization (Publix is only a three minute drive north) makes it the perfect combination of coziness and “roughing it.” I suppose you could even go so far as to call it “glamping,” the newly coined term for the activity of camping with some of the comforts and luxuries of home. A big shout out to the property owner, Rick Clegg, and the property manager, Max, for our stay! P and I only wished that we could have stayed longer. Headwaters Jupiter is available as a vacation rental on Airbnb. Thanks!! If you ever travel to Florida, you should check it out! It was a pleasure to host you and P. We are so glad you and P enjoyed your stay. Tell P there is plenty of wood left for him to chop. We loved your story-telling . Hopefully it will encourage others to come out and experience HeadwatersJupiter! Thanks so much Rick! We really had a great time and loved being on the river. I’m a Jupiter Farms kid and never had that experience growing up. You have an amazing piece of property! Great commentary on your stay–super pictures! !